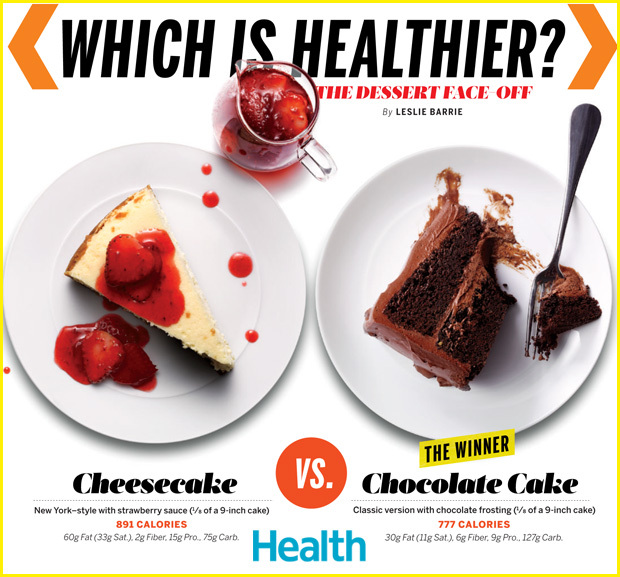 Which is Healthier: Cheesecake or Chocolate Cake? We're not gonna lie: Neither of these meal toppers is exactly health food. Truth is, they're both high in fat, carbs, and calories. But sometimes you've just got to have dessert, and when you do, here's which one you should order. We're not gonna lie: Neither of these meal toppers is exactly health food. Truth is, they're both high in fat, carbs, and calories. But sometimes you've just got to have dessert, and when you do, the chocolate cake is a better pick—and not only because it's less caloric. "Chocolate has health perks like antioxidants and the mineral magnesium," says Stephanie Middleberg, RD, founder of Middleberg Nutrition in New York City. Scrape off the frosting and you'll save about 150 calories. "Cheesecake is so hard to resist," Middleberg adds, thanks to rich ingredients like cream cheese and sour cream (which pump up its saturated fat count). When choosing chocolate, pass on over-the-top varieties like lava cake, oozing with extra fudge, or the seven-tier kinds. By sticking to a slice with two layers, you can have your cake and, well, you know. A hearty ½-cup scoop of chocolate has about 250 calories—less than a slice of cake or pie. When made with milk instead of cream, decadent-tasting crème brûlée has only about 300 calories a serving. "Ooh la la" to that. An ounce contains about 100 calories and 5 grams of saturated fat. Most platters carry three or more types in 3-ounce servings. A berry tart has a nutritional edge over, say, cupcakes. Dig in to the fruit and a bit of the custard, skipping the buttery crust.